We Provide Improved Seeds and Plant Materials to the Global Market. Georgia’s Integrated Cultivar Release System (GICRS) is the official developer of plant materials and breeder seed developed by the University of Georgia’s Agricultural Experiment Stations and College of Agricultural and Environmental Sciences. With more than 19 plant breeders on staff, the University of Georgia is known as an international leader in developing new varieties of plant material and seed that are commercially viable. UGA is also home to the Institute of Plant Breeding, Genetics & Genomics, whose mission is to develop improved plant cultivars by integrating modern plant breeding with genomics and biotechnology. Through its graduate studies programs, UGA is also training the next generation of outstanding plant geneticists and crop scientists. GSD supports this research, and investment in UGA-developed cultivars funds the University’s plant research programs, ensuring superlative crop science lives on for future generations. 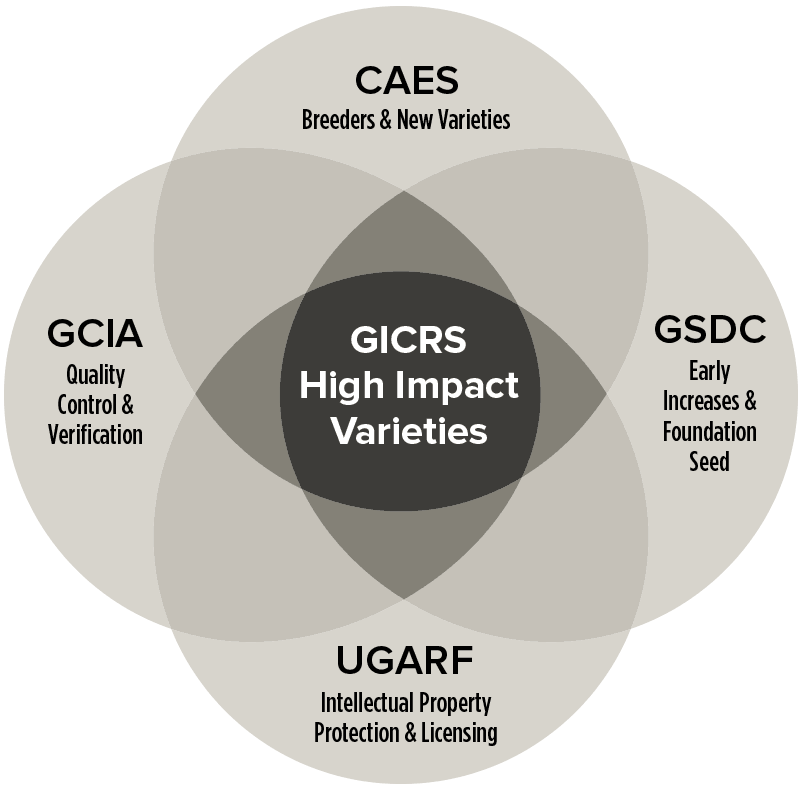 Since 1990, GSDC and UGARF have provided more than $20 million to UGA plant breeders in support of cultivar development.